With an inspiring array of outdoor activities, winter is the ideal time to enjoy the natural beauty of Lake Macquarie – and take advantage of smaller crowds. Make the most of sunny winter days with brisk hikes, brilliant birdwatching, fabulous fishing and coastal cycling, then retire to cosy accommodation to enjoy regional wines and local cuisine on a wonderful wintry break by the lake. Running from the iconic sea caves through the Wallarah National Park, this 6km bushland trek boasts viewing platforms and high cliff lookouts making is the perfect pick for those hoping to catch a glimpse of migrating whales as they slap, breach and blow along the coastline below. 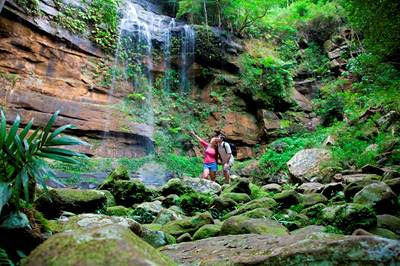 Nestled deep within the Watagan Mountains, this lush 1.7km trail features red cedars and strangler figs as it winds its way to one of the Hunter region's most spectacular waterfalls. Set between ocean and lake this 5-kilomtre return trail teems with wildlife, especially during winter mornings and late afternoons when birdlife is at its most active. Scout for black swans, spoon bills and – if you're lucky – the migratory Bar Tailed Godwit, as well as a range of swamp and marine life. The ideal path for beginners, this track follows the lake via the elevated Redbluff Boardwalk. Commencing at Warners Bay, this track is perfectly located by an automatic Boomerang bike hire station, so you can ride for as little, or as long, as you please. This intriguing 16km path follow an original restored heritage railway corridor, taking in stunning wetlands and an iconic bush landscape between Lake Macquarie and Newcastle. The Drop Over, Marks Point and Pulbah Island are terrific picks for those keen to fish the deeper waters of the lake. Follow the feeding birds for schools of bream, whiting, flathead, jewfish, tailor, kingfish and prawns. Make the most of the region's jetties, parks and reserves at Shingle Splitter's Point in Balcolyn; and Lucy's Wall at Swansea Heads where you can also access the nearby sea caves. Common catches in these parts including flathead, whiting and bream. Let the kids drop a line in from Pelican Foreshore Reserve, the Swansea Channel with its nearby sea caves and picnic tables, the patrolled beach at Blacksmith's Beach, or Speers Point Park. If you're lucky you might snare some flathead, bream, whiting, jewfish, tailor or kingfish in these parts. Shack up lakeside in the newly renovated Esplanade Motel, conveniently situated just a stone's throw from the boutiques and restaurants of Warners Bay, and a short stroll to the northern end of the lake. Book by the end of August and enjoy free on-demand in-room movies and wifi, a $10 discount on all nightly room rates, and complimentary continental breakfast for a two-night+ stay in a Queen Room. Set on the eastern shore of the Lake, Bluebell Retreat is the ultimate relaxation retreat. Enjoy the expansive bushland setting and prime water views to watch the winter sun set at this eco-award winning house, which accommodates up to six. Prices start from $250 per night for a midweek getaway, min 2-night stay and conditions apply. A turn of the century charming blue weatherboard, nestled on the banks of Lake Macquarie, is the perfect place to relax and unwind. Selby Cottage is a self-contained private cottage surrounded by luscious gardens with water lapping the verandah. Prices start from $125 per night for a midweek getaway, min 2-night stay. To plan your winter escape, or discover more great accommodation, log on to: http://www.visitlakemac.com.au or free call 1800 802 044.